Most of the fortress site lies below the ground, although it is situated amongst the extensive archaeological remains of the military and civil settlements that made up Carnuntum across Bad-Deutsch Altenburg to the east and Petronell to the west. However, the southern gate tower of the east gate is consolidated and visible by the side of the main road (image M. C. Bishop). 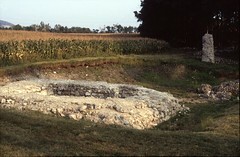 The remains of the military amphitheatre lie to the east of the gate. The visitor will find much to see at Carnuntum but the Archäologisches Museum Carnuntinum contains a great deal that is relevant to the fortress, including tombstones and finds from the legionary site. The fortress at Carnuntum is included in the Der römische Limes in Österreich website.